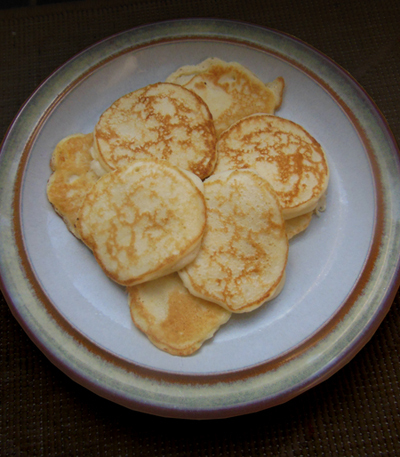 I have mentioned Nigella Lawson’s ricotta hotcakes before but at that time I just included a link to the recipe on her website because I only ever made them very occasionally for my husband who disliked my stodgier Be-Ro dropped scones. Nearly two years on however these have become the ones I ALWAYS cook. It turns out that my children prefer them too and with no sugar in the pancake itself they are a teeny bit healthier. Nigella keeps hers healthy by serving them simply, with strawberries, but in our house it’s golden syrup and chocolate spread all the way, so they do still remain a weekend breakfast treat. You need two bowls and you do need to remember to buy ricotta cheese from the supermarket, but once you’ve made them a couple of times you’ll find that they’re not that difficult to make. Because there is no sugar in the batter they also make a good alternative to blini topped with savory toppings like smoked fish and sour cream. You’ll need two mixing bowls. First separate the eggs and put the egg yolks in one bowl and the whites in the other. 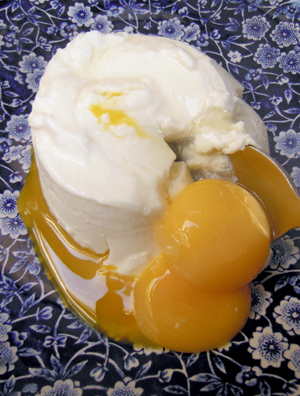 In the bowl with the egg yolks add ricotta cheese and milk. Mix until well combined and then add the flour, salt and baking powder and mix again until you have a thickish batter. Whisk the egg whites in the other bowl until foamy. This will only take a couple of minutes – you don’t need stiff peaks as for meringue. Fold the egg whites into the ricotta mixture with a metal spoon, nice and gently so that you don’t knock out too much air. Heat a large frying pan with a little groundnut oil to a medium high heat. Then add dessert spoons of batter into the pan (I do four at a time). Cook the pancakes for about a minute until golden and then flip and cook on the other side for about another minute. The batter is quite delicate so this is probably the trickiest bit. Continue this process until all the batter is finished, keeping the cooked ones warm on a warmed plate covered with a tea towel (or in my case I act as pancake slave, serving up each batch immediately to my family of hungry little birds who eat them more quickly than I can make them). Showing off my new Burleigh bowl – a 38th birthday present from my mum.